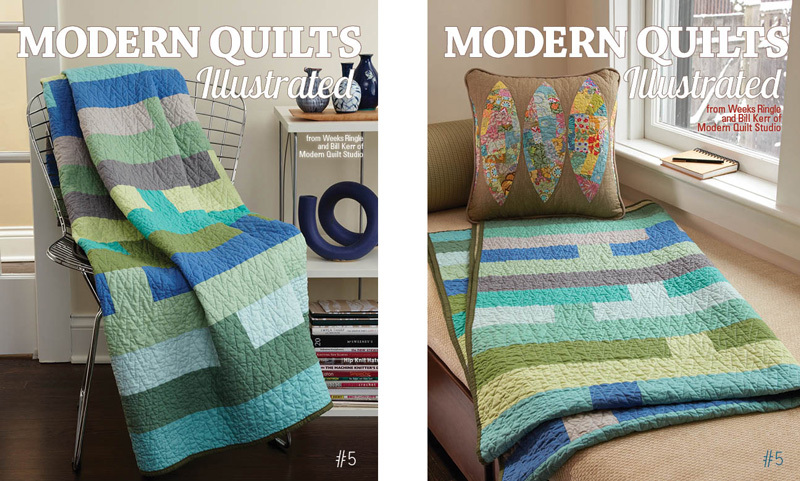 Bill and I were torn over which of these two photos to use for the cover of Modern Quilts Illustrated Issue #5, which goes to print soon. So we posted both options on Facebook and had 200 opinions in an hour. Not wanting to slight those of you who aren’t Facebook users, you’re welcome to cast your votes here as well! Just leave “windowseat” or “chair” in the comments section. FYI, the pillow is the non-quilt project in this issue and the shot that isn’t on the cover will be used as the project shot for the Keeping Tabs quilt in the pattern section. On Facebook, the chair shot is slightly in the lead so we’ll see if you non-Facebook users have a different voice. All precincts are open now but close Thursday night! Chair – can see the quilt better. The window seat – illustrates the variety included in your magazine. Window-seat. The chair one looks like a lot of other photos I’ve seen of quilts, the window-seat makes me want to sit there and look out the window while wrapped in the quilt. Window shot is different…I like it better! Windowseat. The chair is on every other cover. I love the window seat one. Thanks for asking. I like the window seat cover. Windowseat since it has the pillow too. I like the window…with the pillow a nice addition to the beautiful quilt. I like the seat because the other reminds me too much of your recent book cover. I am also intrigued by the pillow and think that will draw interest. Modern chair for modern quilts, AND because you can’t see the word “illustrated” in the windowseat window pic. Chair – the quilt looks more comfy and soft. Definitely Chair! You can’t read the word Illustrated on the other one. I like the window seat picture. The chair one is kind of dark. Forgot to say, loved your presentation at the Ohio Valley Quilt Guild. Can’t wait to receive my book in the mail. Hope you made it home safe. I like the windowseat picture! Chair. Much more of the quilt design is visible in the chair photo. I think the window seat. It fits the one third, two thirds landscape rule, its not about the quilt, its about the design in that photo for me. I like the window seat cover best! It displays a quiet restful love of quilts. windowseat. The chair shot is overdone. Windowseat looks fresher. I like the chair shot. It looks modern and clean. The quilt is the star in this picture. Chair – the window seat version is rather flat. Thank you for your books and advice. I just finished my 3rd quilt – Queen size on home machine – and bindings always turn out will following your ‘one step binding method’. How can we learn more details on where and when you will be on this coast?